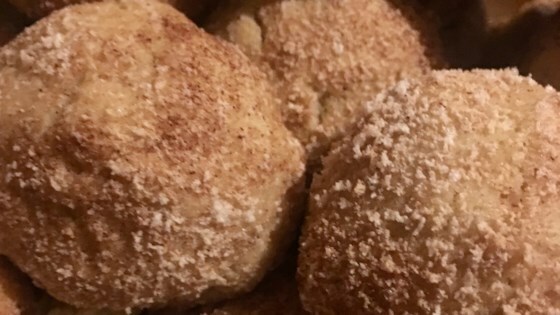 "A quick and easy vegan sugar cookie rolled in cinnamon sugar. Super moist and so delicious!" Mix flour, sugar, baking soda, and salt together in a bowl. Beat vegetable oil, applesauce, almond milk, and vanilla extract together in a separate large bowl; add flour mixture and stir until combined. Divide dough into 14 portions and roll into balls. Spread cinnamon-sugar into a wide, shallow bowl. Roll dough balls in the cinnamon-sugar and arrange onto a baking sheet. Bake in preheated oven until golden brown, about 10 minutes. These classic, top-rated snickerdoodles are rolled in cinnamon sugar.